Walmart Will Implement New Opioid Prescription Limits By End Of Summer : The Two-Way The giant pharmacy chain introduced new rules restricting painkiller prescriptions to 7 days and putting a cap on dosage strength. Pharmacies will carry an overdose antidote wherever it's legal. 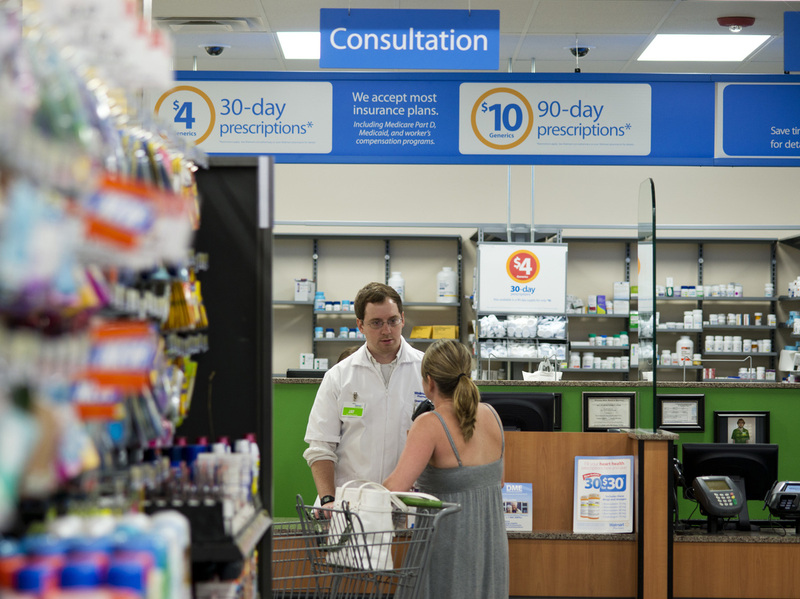 A pharmacist speaks with a customer at Walmart Neighborhood Market in Bentonville, Ark., in 2014. On Monday Walmart introduced a new set of guidelines for dispensing opioid medications. It is the company's latest expansion of its Opioid Stewardship Initiative, intended to stem the spread of opioid addiction, prevent overdoses and curb over-prescribing by doctors. It follows a similar initiative by CVS that went into effect in February. A March report by the Centers for Disease Control and Prevention found overdoses from opioids soared by nearly 30 percent between 2016 and 2017. "We are proud to implement these policies and initiatives as we work to create solutions that address this critical issue facing the patients and communities we serve," Marybeth Hays, executive vice president of Health & Wellness and Consumables said in a statement. Over the next 60 days, the fourth-largest pharmacy chain will cap acute painkiller supplies to cover a maximum of seven days. It will also limit a day's total dose to no more than the equivalent of 50 morphine milligrams. And, in states where prescriptions are restricted to fewer than seven days, Walmart will abide by the governing law. Walmart said the new policies align with the Centers for Disease Control and Prevention recommendations established in 2016. Those rules were meant for doctors prescribing chronic pain medication and encourage primary care physicians to prescribe the "lowest effective dose." By the end of Aug. 2018, the company said its pharmacists will begin using NarxCare, a controlled-substance tracking tool with "real-time interstate visibility." Pharmacies will also carry naloxone, an opioid overdose antidote that has become instrumental in helping to decrease overdose deaths. The life-saving medicine will be offered over the counter, dispensed upon request, wherever it is legal. As NPR has reported, "The medicine is now available at retail pharmacies in most states without a prescription." Retail sales of naloxone, more commonly known by the popular brand name, Narcan, increased by tenfold between 2013 and 2015. Dr. Steven Stanos, former president of the the American Academy of Pain Medicine told NPR the organization applauds "any action that seeks to limit the over-prescription of opioids." But, he added, "That needs to be balanced with the very real need of patients." "Setting a mandatory limit without giving physicians the ability to explain why a patient might need a longer prescription, interferes with the relationship between that person and their physician, who knows them better than the pharmacist," Stanos said. He also explained requiring patients to obtain a new prescription after seven, or sometimes even three days, depending on the state, can become too costly because of mandatory co-pays. Another of the company's changes going into effect on Jan. 1, 2020, is a requirement that all controlled-substance prescriptions be submitted electronically. According to Walmart: "E-prescriptions are proven to be less prone to errors, they cannot be altered or copied and are electronically trackable."